The Ivy race was never really in doubt last season. Cornell was the heavy favorite heading into the season, and the Big Red cruised to a league title, finishing 13-1. Princeton was 11-3, but the league was essentially decided when the Tigers lost by three to Cornell in late February. With no conference tournament, Princeton did not have a chance to enact revenge after two three-point losses to the Big Red. In the NCAA Tournament, Cornell made a great run to the Sweet Sixteen, knocking off Temple and Wisconsin by a combined 31 points before losing to Kentucky. The Big Red lose several key pieces, potentially opening the door for another team to take the crown. 1. Princeton: The second-place Tigers will look to get back on top of the league behind the guard duo of Doug Davis and Doug Mavraides. 2. Harvard: Jeremy Lin is gone, but Freshman of the Year Kyle Casey and three starters return. Tommy Amaker also brought in an impact recruiting class. 3. 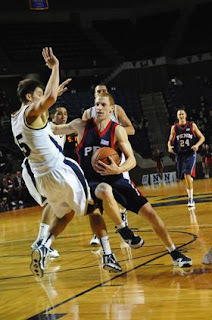 Penn: Although the Quakers only won six games last season, it wouldn’t surprise me to see them rocket up the standings. Five starters return. 4. Cornell: The Big Red will take a step back this season, unless Chris Wroblewski, Mark Coury and a host of role players step up in a big way. 5. Brown: Don’t sleep on the Bears this season. They return four starters from last season, led by all-conference forward Peter Sullivan. 6. Columbia: The Lions will look to snap their streak of 17 years without a winning record in the Ivy. Noruwa Agho is one of the league’s best. 7. Yale: Alex Zampier, the team’s leading scorer, is gone from last year, so Michael Sands will need to step up. This team is always competitive. 8. Dartmouth: Coming off a one-win Ivy campaign, former head coach Paul Cormier will look to bring back the golden days for the Big Green.